Marking the 350th anniversary of the master’s death, 2019 has already been declared the year of Rembrandt in the Netherlands. In Amsterdam, the celebration has unofficially begun with the exhibition of two extraordinary Rembrandt portraits at the Rijksmuseum. 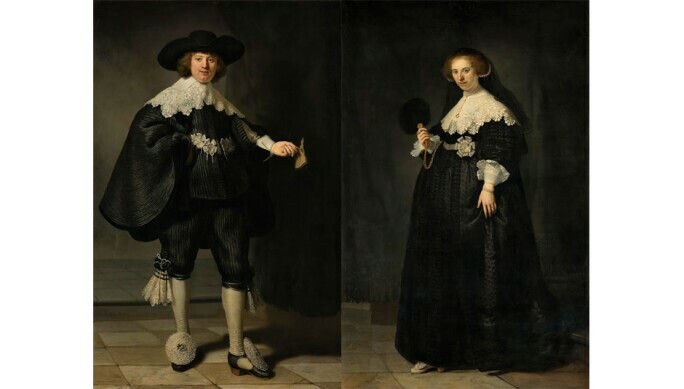 Painted in 1634, the depictions of Marten Soolmans and Oopjen Coppit commemorate the young couple’s marriage and the unification of two prominent Amsterdam families. Rarely exhibited and recently restored, the pictures were jointly acquired from a private collection in 2016 by the Rijksmuseum and the Louvre, where they will be on view in September. Although the full-length likeness was a format typically reserved for the nobility, Soolmans and Coppit were social royalty of the wealthy Golden Age merchant class who commissioned the rising portraitist of the day to paint them in the manner befitting their status. 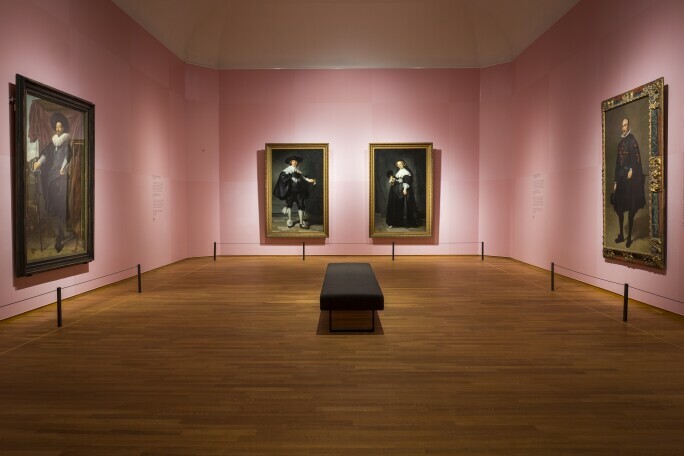 At this scale, these works are not only unusual in the history of art, but are the only pair of life-size, standing full-length portraits painted by Rembrandt. 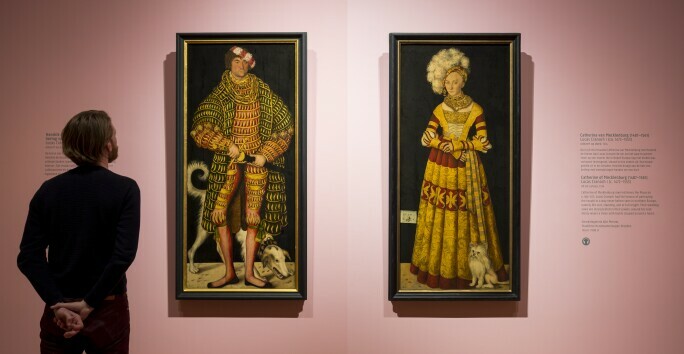 Soolmans and Coppit are among a grand company of nearly 40 likenesses assembled in High Society: Four Centuries of Glamour, the Rijksmuseum’s glorious new exhibition of single-figure, full-length portraits from the early 14th century to the beginning of the 20th. Immortalized here are princes of state and commerce, commanders of military regiments, scions and beauties, politicians and personalities. To execute compositions of this ambition and scale required a reputable artist, and some of the greatest painters are represented here, including Lucas Cranach the Elder – whose pendants of Henry, Duke of Saxony, and his wife, Catherine, serve as the chronological beginning of the exhibition – along with Velázquez, Anthony van Dyck, Veronese, Joshua Reynolds and Manet. There are great names not readily known for the genre, such as Edvard Munch, whose arresting 1907 portrait of charismatic German politician Walther Rathenau is a brilliant synthesis of grand manner formality and avant-garde rawness. The portrait of Rathenau is all the more fascinating because of his biography. A successful, high-profile businessman and Weimar Republic foreign minister, he was assassinated in 1922 by a right-wing terrorist organization that claimed he represented a Jewish-Communist conspiracy. Unsurprisingly, many subjects in High Society have personalities as outsize as the dimensions of their exalted likenesses. 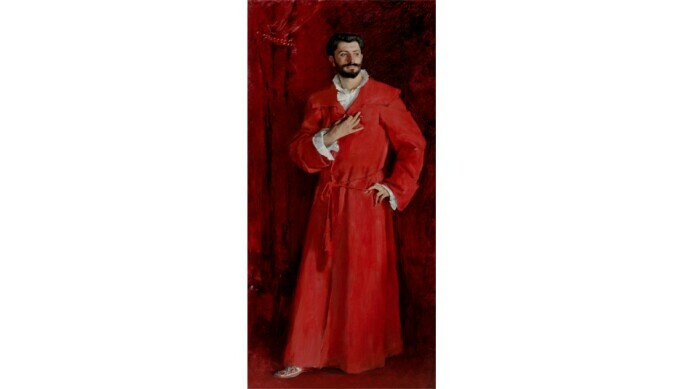 In a blood-red dressing gown, the controversial, womanizing gynecologist Dr Samuel-Jean Pozzi is unapologetically sensual in John Singer Sargent’s 1881 depiction. 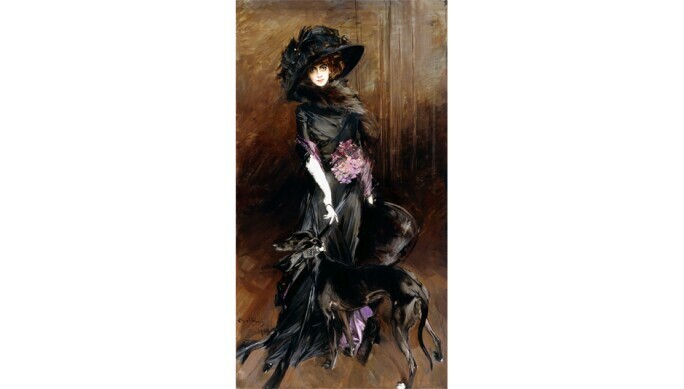 Giovanni Boldini captures the incomparable and eccentric artist’s muse Marchesa Luisa Casati in a whirl of couture, eyes blazing as they gaze from beneath an enormous hat. Known for walking around Venice with two leashed cheetahs, here the Marchesa is accompanied by a dog – canines appear with their masters in no fewer than nine works here. Selecting attire for a portrait sitting was every bit as calculated as today’s red carpet appearance. Colonel William Gordon traveled on the Grand Tour from Scotland to Rome with a kilt and toga-like drapery in Highland tartan with the express purpose of having his portrait painted by Pompeo Batoni, surrounded by classical marbles and ruins. Other subjects in High Society are notable for their conspicuous lack of clothing. Wishing to equate himself with an ancient Roman military hero, British Army Captain Thomas Lee posed for Marcus Gheeraerts the Younger in 1594 wearing a short-hemmed, low-necked tunic, absent pants. While his faithful homage is admirable, Lee could not have foreseen how the passage of time can so mercilessly transform the sublime to the ridiculous. Whatever the patron’s desires, for the artists, such commissions could be lucrative. To return to Soolmans and Coppit’s portraits; Rembrandt would have charged 1,000 guilders per picture (about $200,000 each). Presentation was everything, and the couple is decked out in their finest clothing. Black fabric – given the texture and sheen here, it’s likely silk – was incredibly expensive, representing not austerity but extravagance. Oopjen sports a black-lace veil and ostrich-feather fan, the latest fashion, as well as a more unusual accessory: affixed to her temple is a mouche, a black beauty spot meant to accentuate her milky complexion. Not to be outdone, Marten flaunts a fortune in lace and, on his shoes, “the biggest rosettes in art history,” according to exhibition curator Jonathan Bikker. High Society struts its stuff at the Rijksmuseum though 3 June.